LAST-INSP: a manually entered date showing when the part was last inspected. FREQ-IN-DAYS: frequency of inspection, manually entered by the Quality staff. 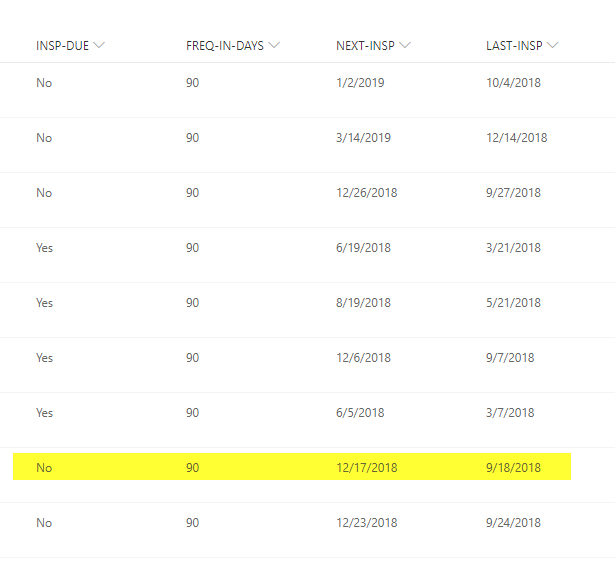 The highlighted row SHOULD have the INSP-DUE field set to YES because the Next Inspection date is equal to today, but it's not updating properly. Is there a known issue with calculated fields? Is there something I'm missing in my formula? Is the date field using local vs. UTC date/time? Is there a parameter in SP Online for calculated fields that I need to check? Update the calculated column itself in the List Setting! Not the answer you're looking for? Browse other questions tagged sharepoint-online calculated-column calculated-column-formula date or ask your own question.